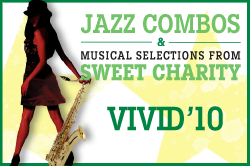 Roosevelt University's Chicago College of the Performing Arts presents Vivid '10, its largest annual musical showcase, tomorrow at 7:30 PM in the Auditorium Theater (50 E. Congress). This year's show includes selections from the musical Sweet Charity and performances from CCPA's jazz combos. Tickets are available at the Auditorium Theater box office at 50 E. Congress or online.